Val McDermid is well known for her adult crime novels and her ability to evoke horror. 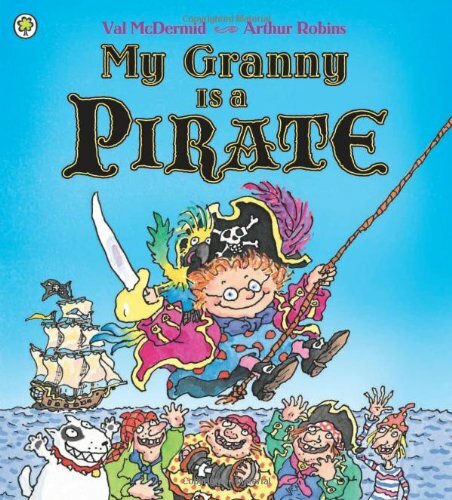 Her first picture book, My Granny is a Pirate is full of her characteristically wicked humour. Pirate Granny makes other pirates walk the plank, ties them up and terrifies them. She fights them and captures them and makes them do terrible pirate type things. Then she breaks the bones of their pirate skeletons and feeds them to her dog, still managing to get home in time for tea! Shiver me timbers! It’s all good sea-shanty-singing fun and will appeal to kids who love rough and tumble and the sense of omnipotence which rebellion brings. Oh, and just in case this makes anybody nervous, the comic action packed illustrations with their delightfully funny characterizations stop it from being too scary while the promise at the end that ‘you can be a pirate too if you keep Granny’s secret’ will send a subversive tingle down the spine. A rollicking tale full of lusty energy.